For over a decade, Sun Oil Limited has been proud to fuel community development through its sponsorship of the Carry Your Brethren On The Shoulders (CYBOTS) Basketball Club. The Club is headquartered at “George Brown Park” on Dumping Ground Corner and has a focus of promoting personal and professional development of the Bain Town Community. Pictured in the center holding a basketball is Sun Oil Limited Marketing Manager, Rufus Johnson with CYBOTS President Wayde Watson at his left at a Saturday practice session. 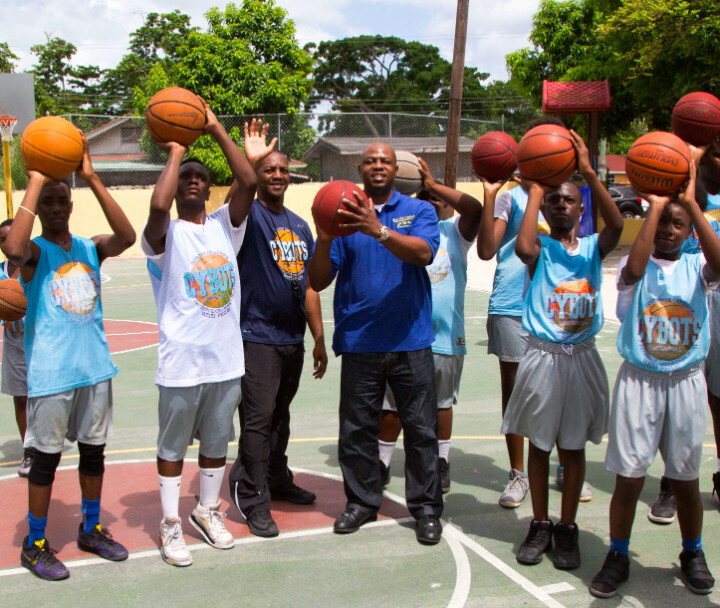 Since 2002,Wayde Watson, a former Bahamian basketball player and product of Bain and Grants Town, has headed the Carry Your Brethren On The Shoulders (CYBOTS) Basketball Club, headquartered at the ‘George Brown Park’ on Dumping Ground Corner. The Club is geared towards the personal and professional development of the youth and adults in New Providence, particularly in the Bain Town Community, with Sun Oil Limited as its primary sponsor. “We take pride in seeing that this Club has been so successful in achieving its goal of positive community development,” said Sun Oil Limited Marketing Manager Rufus Johnson II. CYBOTS hosts several annual community initiatives. One of its projects, dubbed the ‘Shares Programme’ focused around the Thanksgiving season, requires members to give their time and effort socializing and feeding children and senior citizens, in New Providence, who are less fortunate. According to Watson, Sun Oil plays a major role in the sustainability of CYBOTS. With a committed leader and team of over 100 members from all walks of life, and a cadre of titles under its belt, CYBOTS like Sun Oil Limited continues to “fuel growth of people”.